Marine protected areas (MPSAs) are becoming a cornerstone of reef and ocean conservation, involving the setting aside of specific waters to preserve and manage vulnerable resources like declining fish stocks. 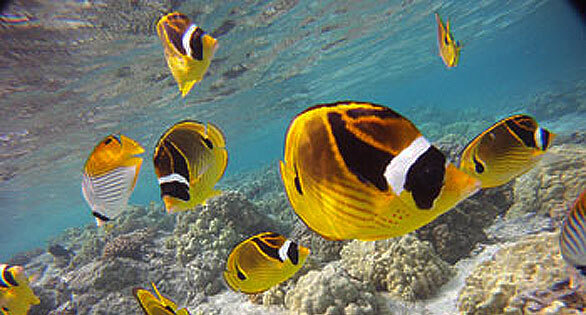 In theory, MPAs provide a refuge in which fishes can breed and help replenish nearby, open areas with their offspring. However, biologists admit there is still much to be learned about how MPAs function and how they impact both fishes and those who fish for them. Surprisingly, fishers near marine protected areas reported having to travel farther to catch fish but were actually able to maintain or improve their social and economic well-being, according to a study by fisheries scientists at Washington State University and in Hawaii. The study, reported in the journal Biological Conservation, is one of the first to look closely at how protected areas in small nearshore fisheries can affect where fishers operate on the ocean and, as a consequence, their livelihoods. Researcher Todd Stevenson: “Counterintuitive finding” from study of aquarium fishers. Image: WSU. “Where MPAs are located in relation to how fishers operate on the seascape is critical to understand for fisheries management, and this is an important lesson to draw from this study,” said Todd Stevenson, the paper’s lead author, who did the research as part of his WSU doctorate. Nearly 6,000 MPAs have been set up around the world, according to a 2010 report by the International Union for Conservation of Nature and Natural Resources. Stevenson focused on a network of MPAs on the west coast of the island of Hawaii and one of the state’s most lucrative nearshore fisheries. While the fishery is relatively small, with only about 40 active fishers providing livestock to the aquarium trade, small-scale fisheries actually employ more people than large-scale operations and catch fish more efficiently. Their small size also makes fishers more vulnerable to changes, as a poorly placed MPA can have a large effect on their options. Starting in 1999, the west Hawaii MPAs closed more than one-third of the coast to aquarium fishing. Many areas were closed to avoid conflicts with dive charters and the tourism industry, particularly in the more populated central part of the west coast. This is where most ports and launches are, too. As a result, fishers had to go farther in search of fish. Analyzing social surveys and state catch reports, Stevenson and his colleagues found just that. “It’s not uncommon to establish MPAs in areas where fishers operate, as these are usually biologically and economically productive spots that receive heavy fishing pressure and thus need the most protection,” said Stevenson. “When MPAs are placed in these locations, they displace fishers into new, slightly less optimal fishing spots. Without a separate economic analysis, said Stevenson, it’s hard to say how the changing fish stocks might have affected fishing incomes. He and his co-authors—WSU Professor Brian Tissot and Bill Walsh of Hawaii’s Division of Aquatic Resources—conjecture the fishers had higher yields, in part because they were steered toward underexploited or more biologically productive areas. Fishers also benefited from rising prices for yellow tang, the most abundant and popular fish in Hawaii’s aquarium trade, and price wars among island buyers working to satisfy the growing demand from coral aquarium tank owners. From materials released Tuesday, Mar. 5, 2013 by Washington State University. Original text and reef image by Eric Sorensen, WSU science writer.